Daily Illuminator: Legendary Loot At Your Fingertips! February 27, 2016: Legendary Loot At Your Fingertips! Every GURPS Dungeon Fantasy adventurer dreams of finding treasure on their quests. And sometimes, those dreams pay off . . . big time. 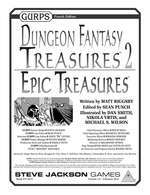 GURPS Dungeon Fantasy Treasures 2: Epic Treasures is a collection of powerful, interesting, and -- well -- epic items, which can form the basis for an adventure or a suitably amazing reward for a mighty deed. GURPS Dungeon Fantasy 8: Treasure Tables author Matt Riggsby presents an assortment of memorable items, including the Sky-Breaking Halberd, the Armor of Perfect Suitability, the Sun Chariot, and much more. Gold is great, but sometimes you want something extra exciting. And Epic Treasures is your one-stop trove for giving heroes what they want . . . if they can prove suitably epic. Download it today, only from Warehouse 23!